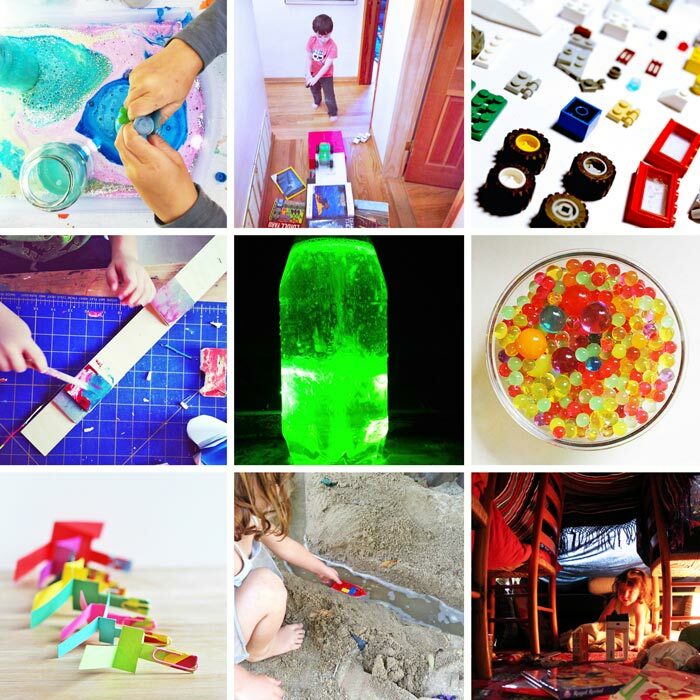 11 years of parenting, 4 years of co-op preschool and 6 years of blogging means that my family and I have tried just about a gazillion projects for kids…. okay maybe not a gazillion but certainly in the hundreds! Some projects have made the blog, others are favorites from other bloggers, and some are just simple creative prompts and activities you can set-up in a matter of minutes. 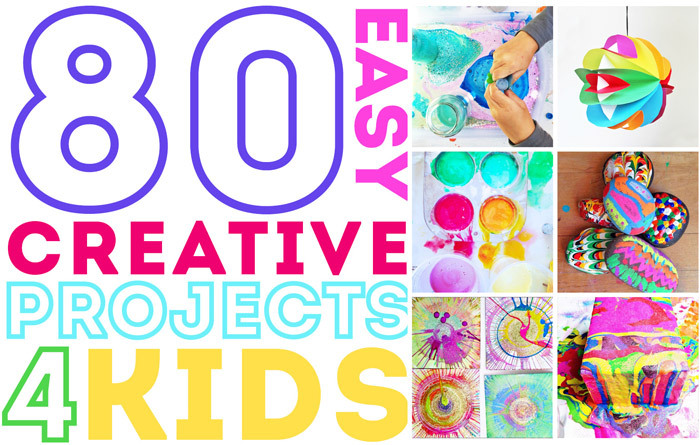 Here is a collection of 80+ EASY CREATIVE PROJECTS FOR KIDS we have tried over the years. 1. Scratch Art We have used store bought scratch art paper as well as made our own. This is the easiest method we have used to make scratch art and this method is less messy for more long term art pieces. 2. Chalk Pastels Take a break from crayons and bring out the pastels! I love the soft pastels because you can blend them with your fingertips to create new colors and shading. 3. Oil Pastels This was my favorite art supply as a child. I love the rich color of oil pastels and the way they glide on paper. For a variation try using light oil pastels on dark colored paper. 4. Paper Scrap Collage Taking a note from Tinkerlab’s Art Tips I have started saving all the paper scraps from projects and cutting them up into pieces for collage projects. 5. Sidewalk Paint We used this simple recipe from Learn Play Imagine. It’s easy to whip up and washes off easily. 6. Pour Painting My daughter loves this process! Without being prompted she tried this on her own using an old wood block we had lying around our art room. Simply pour different colors of tempera paint onto a 3D surface. You can see another version here on rocks. 8. Painting Sticks Sticks make a fun canvas for kids and you can display the results in a simple vase. If you have big branch check out how to turn it into a group art project. 9. Make Your Own Stickers The next time you are at the office supply store buy some white sticker dots. Kids can color them in to create their own stickers. 10. Doodling I admit that a blank sheet of paper often intimidates me. That is why I am a fan of doodling. Doodling is drawing without purpose, drawing without thinking, drawing from the gut. At least that’s how I define it! Encourage your young artist to doodle! Not only is it relaxing but it’s good for the brain! 11. Leaf Collage This was actually a school assignment that I thought was a great idea. Collect leaves and glue them to newspaper. Done! 13. Decorative Tape Collage We tried this activity based on this suggestion from Tinkerlab’s Collage Invitation. I put out some strips of colorful tape, some sticky backed jewels, markers, and paper for my daughter and this is what she came up with. 14. Colored Salt I love making our own art materials at home. We have made colored salt and used it for science and art projects. 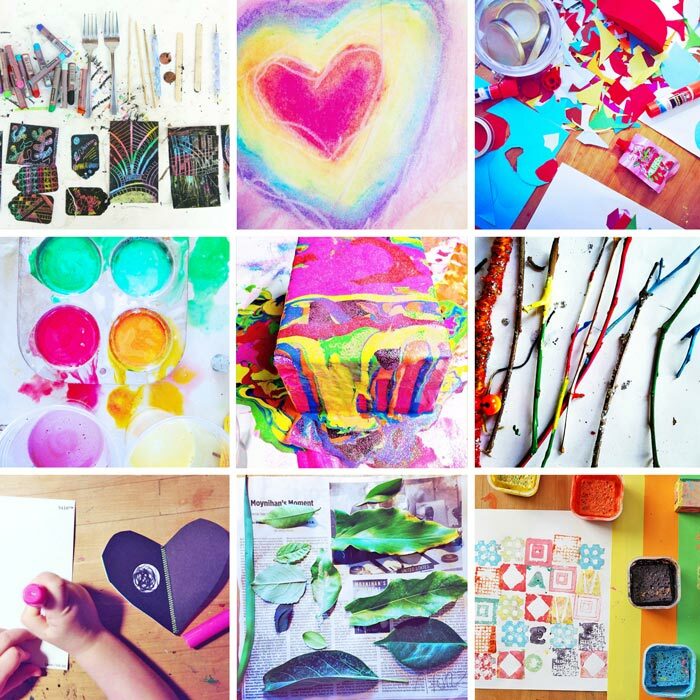 It’s a great starter project for kids who want to be involved in making their own art materials. For the colored salt tutorial click here. 15. Handprint Art Children love to get their hands covered in paint. Let them! Messy art is important for developing creative confidence. Use washable paint and have a stack of paper handy. Better yet, roll out a long sheet of butcher paper and let a group of kids make a giant handprint mural! 16. Parent Child Art My husband and my daughter enjoy doing this. Take a piece of paper and draw a line down the center. Sit side by side with your child and create drawing or painting using the same materials and a theme. For more art games you can do with friends I highly recommend my friend Jeanette’s book Tangle Art. See her symmetry drawing game in action here. 17. 3D Heart Print our template here and make a colorful 3D heart! We made these in my daughter’s first grade classroom for Valentine’s Day. 18. 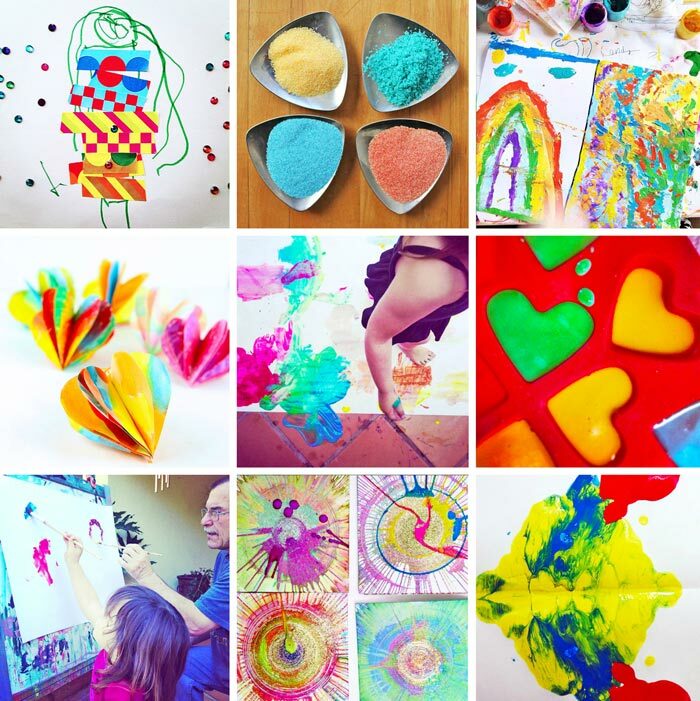 Painting with Feet After doing handprint paintings you may consider letting the kids dip their feet in paint and walk over a long piece of butcher paper! It is a slippery process so be sure to do it on a place they won’t hurt themselves if they fall. You can see it in action here on Homegrown Friends. 19. Homemade Watercolors Another fun homemade art supply to try is homemade watercolors. We used this recipe from the Artful Parent and poured them into some IKEA ice cube trays. My daughter enjoyed the process of both making and using the paint. 20. Shaving Cream Painting This process is messy sensory art fun! Even for grown-ups I might add….Here’s a tutorial on Art Bar to get you started. 21. Easel Art My daughter loves painting at her easel and it shows. When the weather is nice take the easel outside. You can even encourage your young artist to try and paint something they see. Another fun variation is paint with a friend or grandparent! 22. Spin Art This spin art machine is fairly inexpensive and a lot of fun to use, even for the littlest of artist. If you don’t want to buy a machine you can also make spin art using a salad spinner. 23. Ink Blot Color Mixing Both my kids initially said they did not want to try this project and then went on to create multiple “paintings.” If you limit the palette to red, yellow, and blue paint this project doubles as a color mixing lesson. Here is a tutorial with directions on Picklebums. 24. Salt Paintings We used some of our colored salt to make salt paintings. Place a sheet of paper on a cookie sheet. Squeeze glue directly from the bottle onto the paper to “draw” your picture. Dump the excess salt into a bowl. You can add different colors in stages. When finished let dry completely and shake off excess salt. The more glue you use the better the salt will adhere to it. You can also try a variation using plain salt and adding color via eye droppers. See how to do it here on Meri Cherry. 1. Wizard’s Brew We have made this countless times and it always induces lots of squeals and screams of delight! Get the recipe in this post- Item #3. 2. Book Ramps Build ramps out of books! These are great for use with Matchbox cars and remote controlled cars. Enlist your child in the process of making for an easy hands-on engineering project. 3. Lego Building Challenge Lay out a collection of Lego pieces and challenge your child to build something specific from the available parts. This is a much more inventive use of LEGO than simply following premade directions for building. 5. Gluing Wood I had some scraps of birch wood left over from a project so my kids put them to use making wood sculptures held together with wood glue. My kids did not believe that they could glue wood together and that it would hold. The furniture designer in me used it as an opportunity to show them how strong the right glue can be! 6. Paper Helicopters My kids love these! For the full tutorial click here: Paper Helicopters. Place the clear beads in a bowl of water. They will visually disappear….tell your child to feel for them. Place the beads on a paper towel for a few days and watch them shrink back up to their original size. Freeze them! Make a large ice chunk from water and hydrated beads. Then place the icy water bead mix in a bowl or kiddie pool filled with water. The full size water beads will unthaw, shrink, and then grow in size again. 8. DIY Lava Lamp Have you tried making a DIY lava lamp? We used this tutorial to try it. I also tried to make our glow by pointing a laser pen at the bubbling concoction. 9. Clay and Craft Stick Structures It’s not a secret that we like to build with clay. I also love paring it with other materials, in this instance my son used clay and craft sticks to build a tower. Other good parings for clay are bamboo skewers and wood blocks. 10. Sand Rivers This is a classic for me since I personally love to build them! All you need is a sandbox, some digging tools, and access to water. NOTE: This activity is only suitable for sandboxes that drain. Start by digging a long, twisty channel through the sand. For the best river, make it slightly slope from one end to the other. Then dig out “lakes” at each end of the channel. Pack the sides of the channel so they don’t immediately slide inward once water is added. When you’re done creating the river, pull a hose around to the top lake, bury for added effect with the end of the hose pointing into your lake, then turn on a slow trickle of water. Within a few minutes the river will start flowing! Add boats, plastic animals, toy soldiers, bridges, matchbox cars, whatever you can think of! Step Two Show your child how to find seeds in one of the flowers. Start with a flower that has easy to find and distinguish seeds. Some flowers seeds are so tiny your child might not even recognize them so you may need to show them samples of what they are looking for. Step Three Wet a paper towel and place it into the Ziploc baggie. Add several staples across the bottom of the bag about 1 inch from the edge. These will prevent the seeds from falling to the bottom of the baggie. Step Four Ask your child to place the seeds in the bag and press into the paper towel with some spacing in between them. Step Five Seal the bag and tape or hang it in a sunny window or outside in a sunny spot. Your seeds should sprout in a few days! 12. Fort Building Build a fort in your living room! Bring in dining room chairs, chip clips and sheets. Add in a camping light and pillows and you are set! If you love building forts consider buying this awesome fort building kit. 14. Ice Cream in a Bag Everyone MUST try this during the summer! 15. Clay Boats A classic engineering activity, take clay and ask your kids to mold it into mini boats. They will quickly learn what shapes and properties make a boat float! Check out our full tutorial here. 1. Washi Bamboo Another stick decorating project we love: pair bamboo and washi tape together. Bamboo has a smooth texture just perfect for tape to adhere to. Add in some paint on top of it for even more color! 2. Flower Lei If you have a camellia bush or other hearty flower growing ion your garden try this: Gently pop out the center of the flower and string it on a piece of string. Add more flowers and tie the ends together to form a simple colorful lei. 3. DIY Wrapping Paper I have stopped buying wrapping paper except for a major holiday like Christmas, and started trying to wrap gifts with supplies we already have at home. I usually wrap a present in plain white butcher paper then ask my children to decorate for a friend of family member. Duct tape, washi tape, glitter, and Sharpies are some of our favorite supplies for creating homemade wrapping paper. 4. Paper Clip Jewelry My daughter loves jewelry but it is often hard for little hands to work with small beads. Why not use paper clips? String colorful vinyl coated paper clips together to make necklaces and bracelets. To make Paper Clip Cuff cut a toilet paper roll in half and then again down the center. Use paper clips to decorate the edges, and securing it to your wrist with a couple rubber bands. 5. Leaf Garland Gather some leaves and make a hole in them using a hole punch. 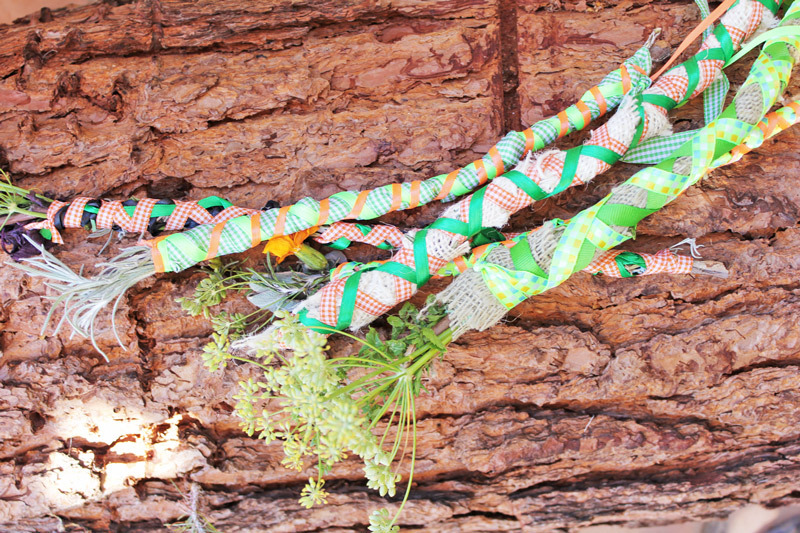 String the leaves onto a long piece of yarn to make a rustic leaf garland. This would also be fun using some decorated leaves. 6. Envelope Book We used astrobrights to make this easy envelope book but you can easily do it with plain white envelopes and decorate them. Skip the cover for an even easier book. 7. Robot Faces Cut some adhesive backed magnetic sheets cut into little pieces and stick them to pom poms and googly eyes. Then stick the pom poms and eyes to tin cans to make robot faces. 8. Paper Planets A simple paper project with lovely results! 10. Paper Beads Have you tried making paper beads? Use different recycled paper for colorful unique beads! Here’s the tutorial we used to make them on Red Ted Art. 11. Toilet Paper Roll People This was a hit at our co-op preschool a few years back. 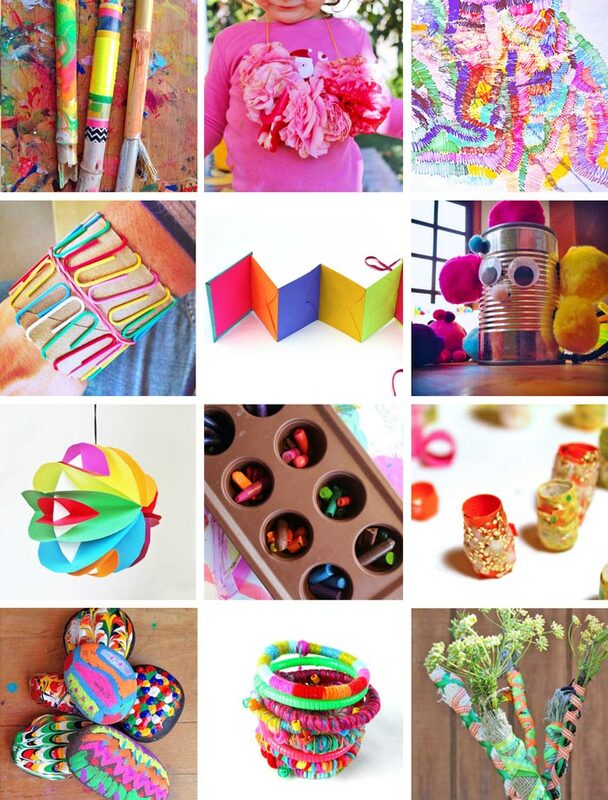 Have children decorate toilet paper rolls as people using googly eyes, fabric scraps, pipe cleaners, and yarn. 12. Decorating Rocks Besides sticks another favorite natural canvas of our is rocks. Chalk markers look amazing on rocks and so does Puffy Paint. 13. Glow Stick Jewelry Don’t toss old glow sticks out! Use them as a base for colorful DIY bracelets. See how we did it here. 14. Paper Dolls We have made many variations of paper dolls over the years. My daughter made a lovely version by cutting paper into blocks shapes for the head, torso, legs and arms and taping the whole thing together. Here is another version of this classic project on Picklebums. Step One Wrap a rubber band around the top of your stick. Step Two Place a stem of herbs under the rubber band and wrap the herb around the stick. Step Three Wrap a ribbon around the stick covering the herbs. When you get to the bottom of the stick tie a knot. Add a dab of glue to secure the knot and prevent it from unraveling. Step Four If desired add beads onto the loose ends of ribbon, knot the ribbon around a bead or add glue at the end, and trim ribbon ends as necessary. Tip: Wrap the end of the ribbon with a piece of clear tape so that you can thread it with beads more easily. If your kids love wands and Harry Potter check out Magic Wands on Red Ted Art. 1. Nature Mandalas Next time you are outside in the garden, collect a few leaves or flowers and create a mandala! Mandalas are decorative circular designs, they can be drawn or created using found materials. Here is another lovely way to incorporate nature and chalk into mandalas. 2. Bubble Wrap Rug Next time you get a package with bubble wrap SAVE IT! Throw it on the floor, connect separate sheets with duct tape and pop away! What a fun way to spend an hour! 3. Book Writing When my kids are really interested in something, making a book about the topic is great way to encourage creative thinking, even if the topic is Minecraft or Shopkins! Here are 5 easy books kids can make and fill. 4. Lego City One of our favorite all-time activities is to bring out the LEGO bin and create and an enormous Lego City. We typically take over a large table and build the city over the course of a few days. Our last metropolis included an airport, police station, jail, Hello Kitty house, park, and lake. I particularly love the collaborative aspect of this project. 5. Cardboard Box It never fails, put a large cardboard box in front of your kids and walk away. Trust me, they’ll be busy for an hour. 6. Pins and Styrofoam Am I the only parent who lets their kids play with pins? Please tell me I am not alone….My daughter loves pushing pins into pincushions and I happily hand them over to her. We had a bunch of Styrofoam lying around this week and both my kids started pushing my sewing pins into it all on their own. I also gave them some beads to pin through for an extra fine motor skills task. If you are squeamish about using beads golf tees and Styrofoam is another classic fine motor activity. Check it out on Fun A Day. 7. Light Show Grab a handful glow sticks, turn out the lights and swing them around! The light leaves faint traces as your move them. This is a great activity to try this in front of a big mirror and the perfect way to work out some pre bedtime energy! 8. Bead Sorting Kids love to sort small objects! I had a ton of these flat marbles lying around and one day I gave my daughter a baking pan full of them along with 4 mini Ziploc bags. She started filling the bags with gems and giving them out to each family member as presents. I love seeing how kids come up with their own ideas about what to do with simple provocations. 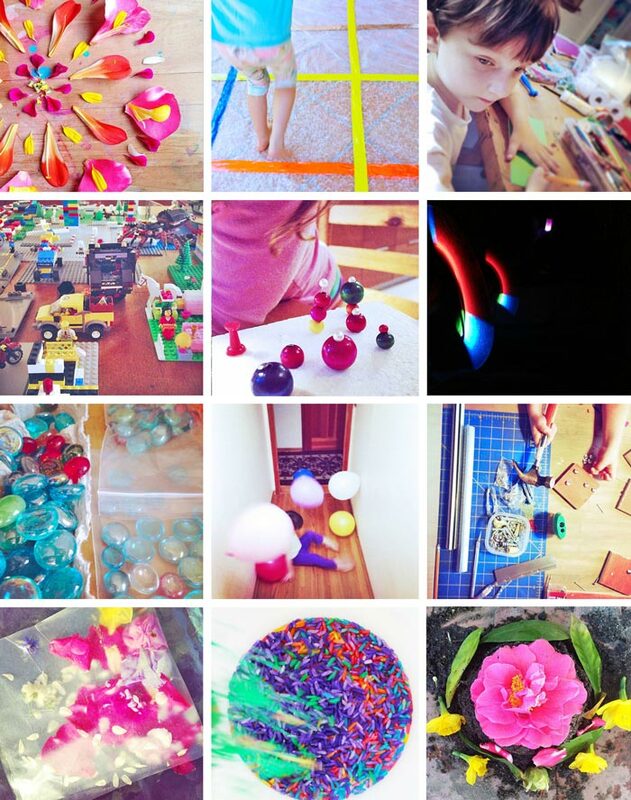 For some more creative provocations check out the Creative Table Project on Tinkerlab. 10. Shaker Noisemaker Easiest homemade instruments ever: grab a few small Tupperware containers and some small, noisy objects: think beads, rice, beans, pasta. Place them in the containers and make your own shakers. Ask your child if they can hear the differences in the sounds made by various objects. 11. Balloon Fun Besides a cardboard box, the cheapest toy you can buy for your kids that provides hours of fun has to be balloons. One of the best activities we have done with balloons is to bounce them in a confined space- a long hallway is perfect for this! My daughter also loves to draw faces on them with Sharpies and you can’t go wrong with rubbing them on your hair in front of a mirror! 12. Woodworking Balsa wood is soft and perfect for kids to work with because it’s really easy to nail into. Here is a simple woodworking starter project: Cut a few pieces of balsa wood into smaller pieces, put them out on a table with some tools, tacks, screws, and small nails and invite your kids over! My kids LOVED this activity to say the least, especially hammering. Make sure your children know how to use the tools safely, and supervise as needed depending in their ages. With proper precaution this simple woodworking activity is a sure hit for kids even as young as 4. 13. Flowers in Contact Paper Cut two sheets of clear contact paper. Peel the backing off and stick flower petals to the sheets. When done place the other sheet on top and seal along the edges. Hang this in the window for some colorful flower suncatchers. The Artful Parent has a lovely tutorial for this using a paper plate as a frame. 14. Confetti Rice Colored rice is a wonderful material for sensory play. See a few ways we have used it for play here: Confetti Rice and get the recipe for dying it here on Fun At Home with Kids. 15. Outdoor Bakery My children love “baking with nature.” This usually means making cakes from mud or sand and then decorating them with flowers leaves, even spices from our herb garden. A fun addition is to put sand in and old spice shaker and use it as “sprinkles.” If your kids are really into making mud pies and cakes try setting up a mud kitchen. 16. Tape Roads We love using painter’s tape to map out roads on our kitchen floor! It comes off easily when you are done with the project. P.S. If you have a long hallway consider mapping out a bowling lane on the floor. Use wood block as your pins and a soccer ball as your bowl ball. 1. Spinfinte Tops These easy to make tops spin for-ever! 2. Rope Climbers We made these using pre-cute paper doll shapes. For the full instructions head over to Pink Stripey Socks. 3. Cup & Ball Game Transform a yogurt cup and skewer into game that gets your hand-eye coordination. 4. Tin Can Stilts A classic DIY toy! For the full tutorial click here: Tin Can Stilts. 5. Tube Blocks Yes, we did make building blocks from TP rolls! 6. 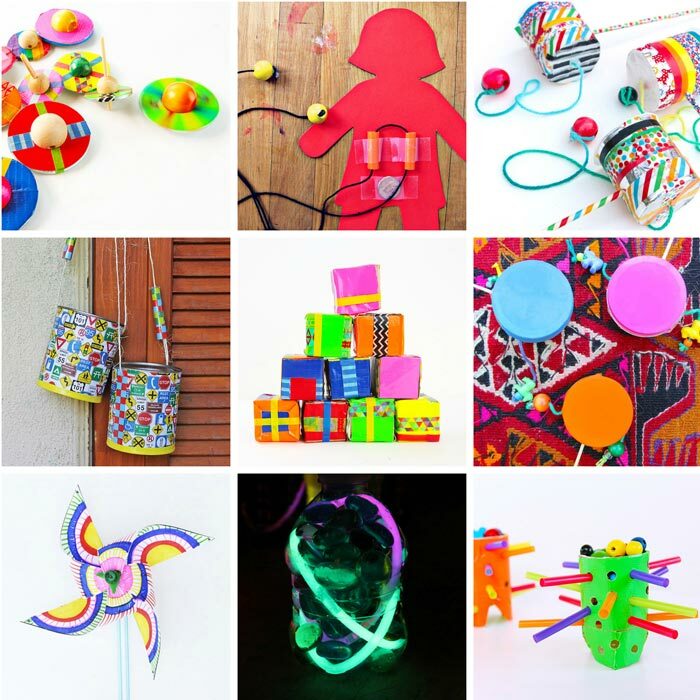 Rattle Drums My kids love homemade noisemakers and these were fun to both make and spin. 7. Hexactly Fun If you like block play consider adding this set into your collection. The hexagon shapes offer a new building challenge to kids Hexactly. 8. AquaDoodles If you don’t have AquaDoodles run out and buy a set. It’s just a simple cloth board that changes color when wet. But it never ceases to amaze kids (or adults for that matter). 9. Marble Run A favorite project we do every once in a while using items for our recycling bin. 10. Op-Art Pinwheels Print out our template and make a few colorful pinwheel for your garden! This is a temporary project! These Disco Discovery Bottles will glow for one night only. If you want to keep them longer consider omitting the hot glue step and changing out the glow sticks when you want to use them again. 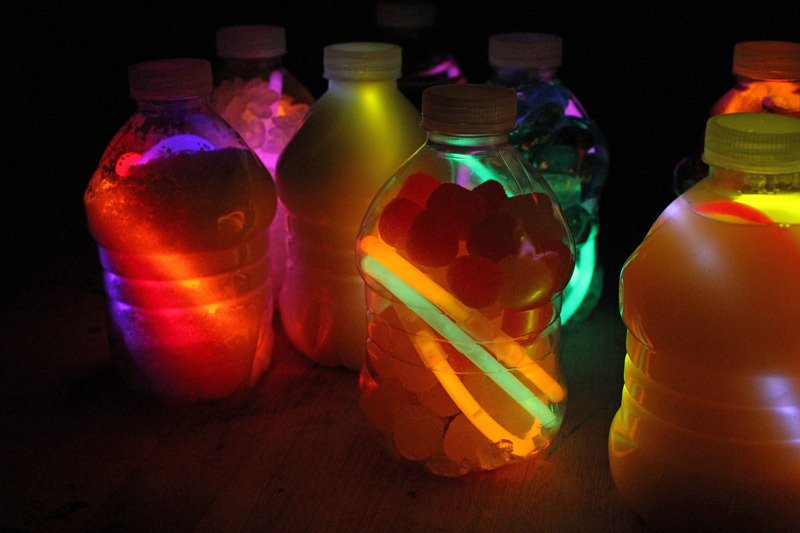 You also may want to consider making these at night to be able to see the effects of the light diffusion right away. Step Two Start activating the glow sticks by cracking and shaking them so you get a nice glow. The glow sticks we used came with connecters to make them into bracelets. We connected the loose ends of each stick and then placed several glow bracelets in each bottle. Step Three Pour in the light diffusing materials! Step Four To make these baby safe add a ring of hot glue around the inside edge of the cap and screw it on tight. Add another layer of hot glue around the bottom of the cap to seal it in place. 12. Ball Drop Game A mini DIY version of the classic Kerplunk! 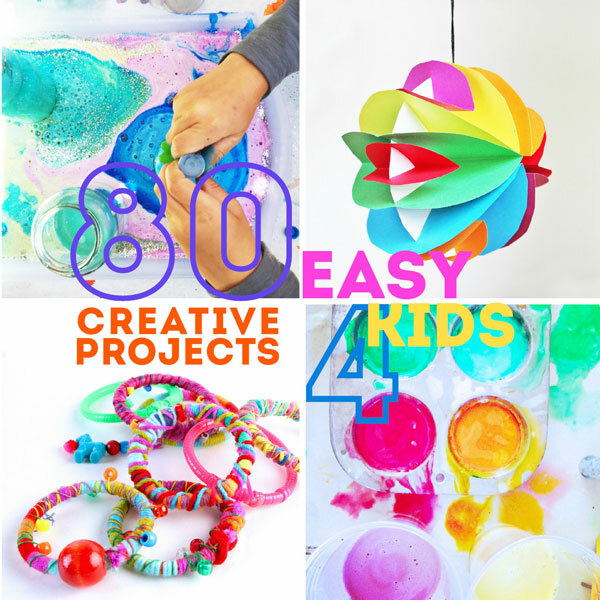 Well this list of projects for kids ought to keep you busy for, oh I don’t know…a YEAR! It certainly has kept our family creating for along time! I love your lessons and have been sharing them with kids in my community. Is this resource avaluable in hard copy? If yes, I would like to buy it! Thanks for your creativity and the clear, accessible way you present your ideas. Awesome!! Your comment made my day Holly! I do not have this available as a PDF but you just gave me great idea! Stay Tuned! Now this is an awesome gift! These activities will not only help in keep the kids away from screens but will also encourage creativity and fine motor skills!